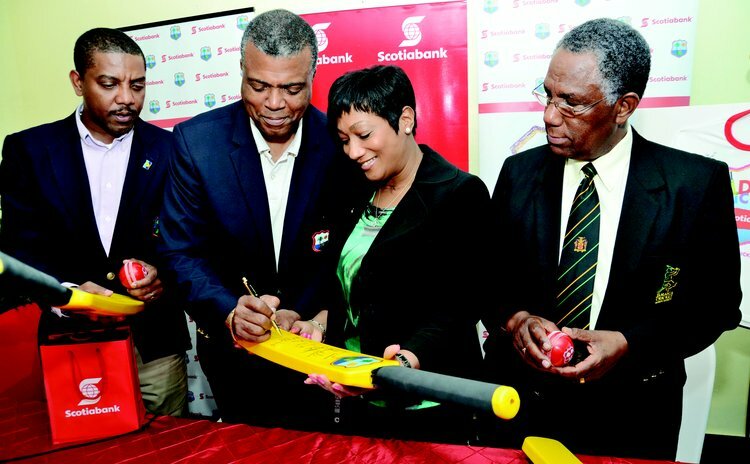 JAMAICA, July 11, 2013– Scotiabank and the West Indies Cricket Board (WICB) this week signed a new five year contract to officially return the Bank as the exclusive sponsor of the Kiddy Cricket Programme and the Official Bank of West Indies Cricket. The contract was inked at the headquarters of the Jamaica Cricket Association by Dave Cameron, the new President of the WICB, Michael Muirhead, Chief Executive Officer of the WICB and Scotiabank Director of Marketing for the English Caribbean, Heather Goldson. The new agreement will see the Bank almost doubling its investment in the Kiddy Cricket and is the longest sponsorship contract that the Bank has signed with the WICB in its 14 year history of the supporting the game. Scotiabank's renewed investment in the programme comes as a clear commitment to the development of West Indies Cricket and an vote of confidence in the future of the game. "We have seen significant progress in the Kiddy Cricket programme over the last 14 years as title sponsors. We have reached over 750,000 children since inception, and have had the satisfaction of seeing Kiddy Cricketers rising to the pinnacle of the game as national and as West Indian players. We are fully committed to continuing to play our part in growing the sport, and building that next generation of cricket greats, explained Heather Goldson, Regional Director of Marketing for the English Caribbean. Commenting on the renewal of the contract with Scotiabank, WICB's President and CEO, Michael Muirhead said "WICB holds the Kiddy Cricket programme as a high priority initiative as it is the base of the cricket development path in the region and we are very pleased to renew this sponsorship with our long standing sponsor and partner Scotiabank." The new contract will allow the Board to execute an expanded technical programme aimed at teaching foundation cricketing skills to the over 150,000 students who are currently enrolled. As part of the expanded programme, Scotiabank will be funding the provision of close to 10,000 Kiddy Cricket kits including bats, balls, and stumps to schools across the region. Scotiabank's Senior Vice President for Caribbean Region, Claude Norfolk was pleased to see the regional cricket sponsorship contract renewed as he believes in the power of cricket as a positive and unifying force in the countries that the bank operates. "We recognize that cricket is one of the strongest unifying forces in the region and Scotiabank is proud to have played a pivotal role for more than 14 years in supporting the growth of the sport and passing on that legacy to the next generation." As part of the new agreement, the WICB and Scotiabank will work together to provide students with increased opportunities to improve their skills, through friendly interschool games. The Board will roll out the piloted Scotiabank WICB Kiddy Cricket Festival regionally to all participating countries in the Eastern Caribbean. The Festival allows students to play a series of preliminary zonal games culminating in a final event with the top 8 schools in the island challenging each other for the title of top Kiddy cricket School and the Championship Trophy. The Festival which was introduced in the larger territories last year has proven to be an ideal opportunity for students to display their skills and coaches to identify talented players. Photo: Dave Cameron looks on as WICB President Michael Muirhead signs a Kiddy Cricket Bat to mark the new contract signing. Also observing the proceedings is Linval Wright, President of the Jamaica Cricket Association.